The drawings contained within this section are intended to represent a variety of thermoplastic roof system applications while remaining generic with regards to manufacturers’ specific application specifications. They do not represent all possible manufacturer application roof system designs. Consult manufacturers’ specifications and RoofStar Guarantee Standards to develop a system acceptable to both the manufacturer and the RoofStar Guarantee Program. 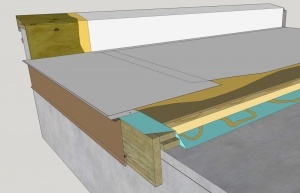 For further information about thermoplastic (TPO and PVC) membrane system designs and requirements, see TPO/PVC (Thermoplastic Membranes) Roof Assemblies.